So you’ve got your pattern, fabric and haberdashery for your project. Can you start sewing right away? Not quite, there are a few preparations you need to do before you can turn your sewing machine on. 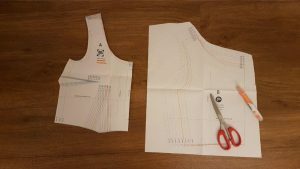 First of all, measure yourself in order to choose the right size for your sewing project. You might also be in between sizes but the great thing about making your own clothes is that you can customise your garments to your body. More about how to do this will follow in a separate post. Then analyse the pattern you’re about to use with the different pieces needed for the garment. Highlight the outlines of your size on the paper pattern to make the cutting part easier. Once this is done, go ahead and cut out all the different pieces. Ideally, you wash, dry and iron your fabric before you start sewing. 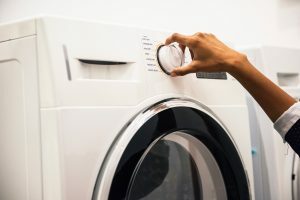 The reason for that is that your fabric may shrink slightly when you wash it for the first time and it would be a shame if your newly finished garment would be too small after the first wash. Please make sure to follow the laundering instructions from your fabric for this – I recommend making a note of it when you purchase your fabric. If for some reason you can’t wash your fabric, you should definitely iron the fabric with full steam (if that’s possible for the fabric you’ve chosen). Either way, make sure to iron out any wrinkles so that your fabric is nice and smooth. After you washed and pressed your fabric, make sure to lay it out on a clean and flat surface. 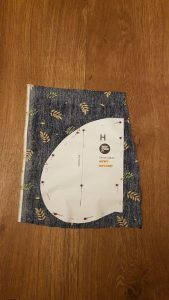 Have the printed side of the fabric facing up (the printed side is also called the right side). Then fold the fabric in half. This enables you to cut one perfectly symmetrical piece or if you need two identical pieces, to cut it out in one go. When folding the fabric, join together the two selvedges together. A selvedge is the edge of woven fabric which prevents the fabric from ravelling. Smooth out your fabric once again so that there are no folds. 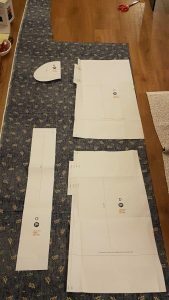 On fold: this means that you have to place the line of your pattern piece which indicates that it has to be cut on the fold of the fabric. This will give you once symmetrical piece after the cutting – so the pattern piece represents half of the end piece. Grainline: your pattern piece might have a long line across it labelled as the grainline. 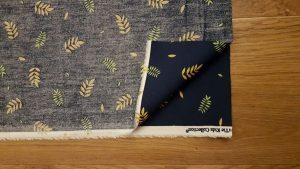 If that’s the case, you need to place your pattern onto the fabric so that the grainline is parallel to the selvedge or fold (it ensures that you cut out your pieces in a straight way). Pro tip for the grainline💡: start at the top of the grainline, measure the distance to the fold or selvedge and pin it in place. Then go to the end of the grainline, measure the same distance and pin it in place. Depending on the size of your piece, you might want to measure and pin some more points on the grainline. When you pin your pattern onto the fabric, use a lot of pins as it will make the cutting part easier afterwards. Finally, it’s time to cut out the different pieces. It’s better to do this while standing and important not to lift the fabric off the table as you cut – strangely enough I found this rather difficult. Note that there are special scissors for cutting fabric, so don’t use your normal household scissors. Try to make big, confident cuts with the scissors for a better result. Pro tip for cutting💡: if you have limited space as I do, you might want to cut out the rough outline first so that you have a smaller piece to work with for the precise cutting part (see picture above).